The Keck Observatory sits atop Mauna Kea on the Big Island of Hawaii. The twin telescopes at the W.M. 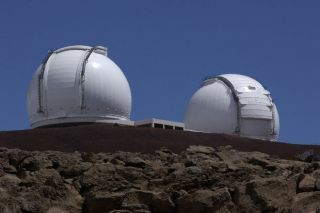 Keck Observatory are the largest optical and infrared telescopes in the world, according to the observatory's website. Because of the size and location of the telescopes, they are in high demand among professional astronomers. (The observatory is not open to the public.) Keck has participated in several notable discoveries. The observatory is located atop Mauna Kea, a dormant volcano in Hawaii. Because it is so near the equator, Mauna Kea makes an excellent astronomical observation site. "In the middle of the Pacific Ocean, Hawaii Island is surrounded by thousands of miles of thermally stable seas," the Keck Observatory wrote on its website. "The 13,796-foot Mauna Kea summit has no nearby mountain ranges to roil the upper atmosphere. Few city lights pollute Hawaiian night skies, and for most of the year, the atmosphere above Mauna Kea is clear, calm and dry." Both telescopes, named Keck I and Keck II, measure 10 meters (32.8 feet) across. The mirrors for each telescope are made of 36 lightweight segments that work together similarly to a single mirror. The telescopes are housed in insulated domes of 700,000 cubic feet. Giant air conditioners run all day to keep the temperature at or below freezing. This helps reduce deformation of the telescopes' steel and mirrors, according to the Keck website. The primary mirror assembly of the 10-meter Keck II telescope is made of 36 parts that can adapt to atmospheric conditions. Funding for the telescopes comes from a philanthropic organization known as the W.M. Keck Foundation. The entity was created in 1954 by William Myron Keck, who founded the Superior Oil Company, according to the foundation's website. "Mr. Keck envisioned a philanthropic institution that would provide far-reaching benefits for humanity," the foundation said. "By taking a bold, creative approach to grant making, he created a legacy that the foundation proudly upholds today." The telescopes' arsenal of instruments includes several for optical wavelengths and others for infrared. Keck II houses DEIMOS (Deep Extragalactic Imaging Multi-Object Spectrograph), which can pick up spectral information from 1,200 objects simultaneously. Keck I has HIRES (High Resolution Echelle Spectrometer), which can examine the colors of starlight. Examples of infrared instruments include the laser adaptive optics system (available with certain instruments on both telescopes), and Keck II's NIRSPEC (The Near Infrared Spectrometer). Some of NIRSPEC's scientific investigations include looking at radio galaxies that are very far from Earth (which means they are older according to the Big Bang Theory, which says the universe arose from a singularity and is expanding ever since.) NIRSPEC can also be used to learn more about brown dwarfs, which are objects that are considered "failed stars" — immense gas giants that are not quite large enough to start nuclear fusion. Because the atmosphere changes so quickly, the telescopes need to change form rapidly as well. Both telescopes can alter its mirror 2,000 times each second, making images 10 times clearer than they would be without the system. They rely on a laser to make the measurements on how to change, which is an improvement over the old method: using a bright star, which isn't easy to achieve as this is only possible in about 1 percent of the sky. "Astronomers developed laser guide star adaptive optics using a special-purpose laser to excite sodium atoms that sit in an atmospheric layer 90 kilometers above Earth," the observatory said. "Exciting the atoms in the sodium layers creates an artificial 'star' for measuring atmospheric distortions and allows adaptive optics to produce sharp images of celestial objects positioned nearly anywhere in the sky." Keck's twin telescopes have made a host of discoveries since construction finished. It helped measure the size of a distant world that is about the size of Uranus. It uncovered four quasars (galaxies powered by black holes) in a single system. It found out that a galaxy is almost entirely made of dark matter. It tracked down interesting atmospheric activity on Jupiter's volcanic moon Io, as well as Neptune. It peered at a star with a strange pattern of brightening and dimming; though later attributed to dust, at the time, some people were calling it a possible alien megastructure. In 1999, the observatory assisted another observatory with watching the first exoplanet transit across its parent star. This occurred after Keck did measurements of star HD 209458 and noted that the star appeared to wobble, as though there were a planet altering its movements. The science team then asked other astronomers at the privately funded Fairborn Observatory in Arizona to watch for a transit across the star's face, which occurred as they predicted. Another discovery was figuring out how stars move in the Andromeda Galaxy, a prominent galaxy that is 2.5 million light-years from Earth, making it a very close neighbor. This was important because it helped astronomers understand just how immense this galaxy is. In 2015, Keck helped track down what was then called the most distant galaxy ever found — EGSY8p7, which is about 13.2 billion light-years from Earth. Its extreme distance means the galaxy dates from just 600 million years after the Big Bang that created the universe. Examining such galaxies helps astronomers learn more about the history of the universe, especially the ancient universe. The next year, astronomers revealed early work from examining galaxies that date back from the end of the Dark Ages, referring to a time when light could not penetrate the universe's opacity.